Hi friends! 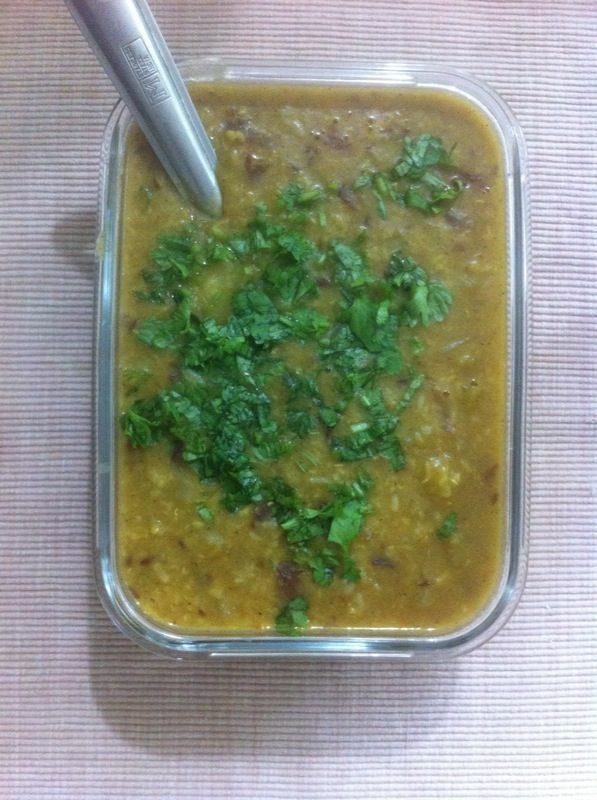 Mung dal with Lauki/bottle gourd is a delicious combination of lauki and lentils. It is a delicious Indian recipe served Indian cuisine. Wash well and soak the Moong dal in three glasses of water for 3-4 hours (same water is used while cooking the dal). keep aside. Heat oil/ ghee in the pressure cooker, asafetida, when turns pink, add cumin seed, when cumin starts to splutters add coriander powder. Fry for few seconds (do not let it turn dark brown) . Add the moong dal with three glasses of water to this seasoning. Add the lauki cubes, salt, turmeric powder, chili powder and grated ginger to it. Close the lid of the pressure cooker and cook till the full pressure is formed ( after the first whistle, switch of the heat). let it cool. Heat ghee (clarified butter) in a thick bottom pan, fry onions till golden, put gram masala fry for a few seconds. Add this seasoning to the dal and mix well. Garnish it with fresh finely chopped coriander leaves. Serve hot with boiled rice, pulaows or geera rice and all the Indian breads. Note: Moong dal is cooked in many different ways in India. This recipe with the goodness of lauki/ Ghiya/ bottle gourd is very delicious and a healthy recipe. 1.It is good source of protein and dietary fiber. 2.It is low in fat and rich in potassium ,calcium and B complex vitamins. 3.It is easy to digest and not like other pulses which are heavy for digestion. 4.Dietician always recommend to eat fibrous lentils at least three times a week. 5.The fiber in these lentils help to decrease high cholesterol. 6.Mostly this dal is cooked for sick persons in home as it is easily digestible. In fact, traditional healers recommended consumption of this bottle gourd to treat various conditions. Here are some of its benefits you must know. Aids digestion: People suffering from constipation should eat bottle gourd as it is high in fibre and helps clear the food stuck in your colon. Additionally, juice made out of bottle gourd also helps in the treatment of acidity as it is alkaline in nature . Great for weight loss Bottle gourd is one of the best foods you can have if you want to lose weight as it is 96% water, and a 100g serving contains as little as 12 calories. The high fibre content will take care of your hunger, and keep you feeling full. Helps treat urinary disorders Bottle gourd has a cooling effect on your body, and a glass of bottle gourd juice is a great diuretic that can be used to treat burning sensation while passing urine. This burning sensation is caused due to high levels of acid in the urine, which can be countered by the alkaline nature of bottle gourd juice. Refreshes you during summers: Just like cucumber, bottle gourd too has a high amount of water which keeps you hydrated during summers. Drinking a glass of its juice will ensure that you do not face loss of sodium, fatigue or extreme thirst while you are out in the sun. This makes it great for people whose jobs require them to travel in daylight. Prevents heart disease: Unhealthy lifestyles are leading to several cases of heart disease in urban India. So much so that, 70% of the urban population is at risk of heart disease due to wrong lifestyle choices like eating fried and processed foods, smoking, etc. Like a lot of fruits and vegetables, bottle gourd has zero cholesterol and is rich in vitamins like vitamin C and antioxidants making it good for your heart . Reduces stress It is quite easy to feel stressed in today’s times, and unhealthy eating can only worsen the situation. Bottle gourd has a high water content has a cooling effect on your body which makes you feel better the very moment you take it. It also has diuretic, sedative and antibilious properties which makes your body feel better internally, and keeps stress at bay.